Along with the whaleshark, divers coming to Thailand normally have manta rays on the top of their wish-list. If you are lucky enough to dive with a manta close up, or even just catch a glimpse a manta underwater, it’s a mesmerising experience. Like giant aquatic birds, mantas “fly” though the water with a silent grace like eagles soaring on air currents. Mantas often live near reefs and are not uncommon in Thai waters. We are lucky enough to see manta rays quite often at several dive sites reached by day trip or liveaboard from Phuket and Khao Lak. 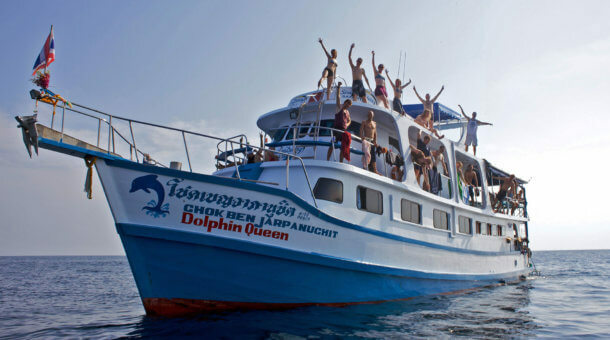 The dive sites with most encounters are Koh Bon and Koh Tachai which are found to the north of the Similan Islands. Manta sightings are common through the whole season. Normally best around February – March. No guarantees of course! These 2 sites feature manta ray cleaning stations where smaller fish like wrasse will clean off dead skin, parasites from hovering mantas. 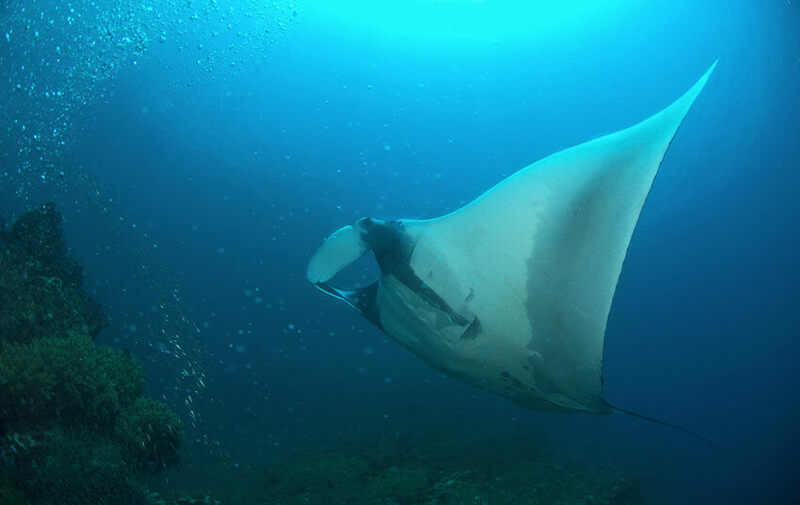 We do also see manta rays at Phuket dive sites, especially at Racha Noi Island. Mantas are also found commonly in the more remote Mergui Archipelago in Myanmar, which is north of the Similan and Surin Islands. 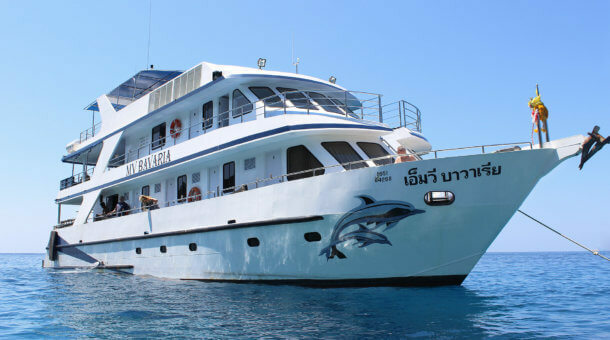 For the best chance of seeing mantas and the best diving, you should join a liveaboard. 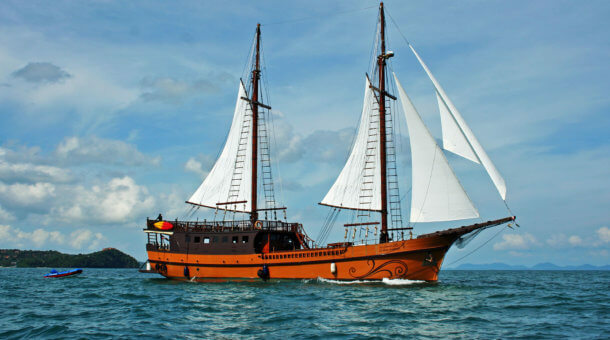 Check our website for liveaboards in Thailand and liveaboards in Myanmar. 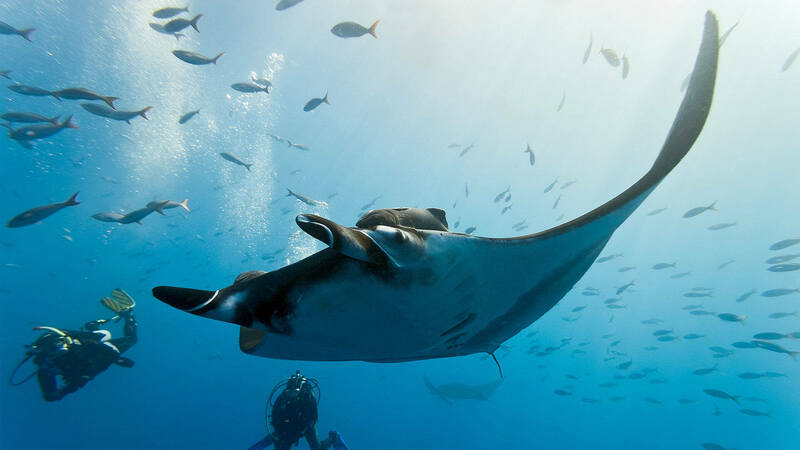 There are actually 2 species of manta rays – the reef manta, which have a “wingspan” up to about 3-4m and are far more commonly seen, and the larger oceanic manta which averages 4-5m in width and can be up to 6 or 7 meters! We do also sometimes see smaller mobular rays which look like mini manta rays, but are a different species, with a wingspan up to about about 2 meters. While manta rays are normally solo or in small groups, mobular rays often swim in large groups up to 100 or more individuals. Manta rays first got their name from Spanish sailors – the word ‘Manta’ means blanket in spanish. Mantas feed mostly on plankton which is filtered through specially adapted gills. They are often seen feeding with mouth open near the surface and sometimes right near the bottom also. In some cases mantas will do underwater acrobatics to fill their mouths with plankton rich water. Every Manta has a unique pattern. 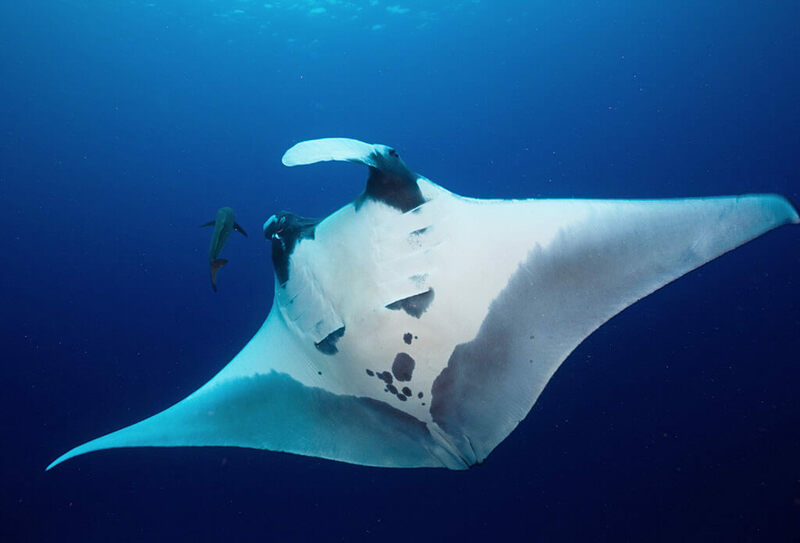 Most mantas are black on top and mostly white underneath with dark patterns, although some mantas are mostly black and there are some which are almost lacking dark coloration. More information can be found on the Manta Trust website. 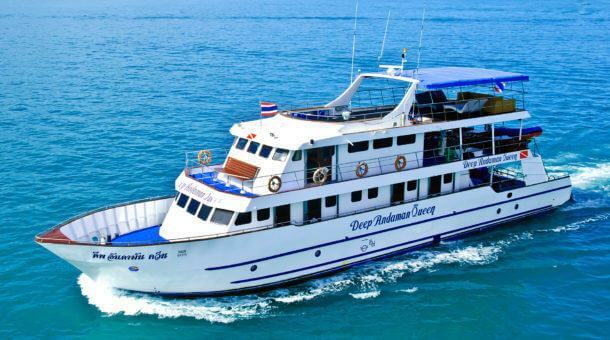 We hope we can help you dive with a manta ray here in Thailand!